Seasonals in Treasuries are relatively mixed going into year end. Shorter term stats suggest a bearish tilt, while more dated data suggests support. Either way, there doesn't seem to be enough evidence to count on seasonal tendencies. Instead, we'll stick to the chart and fundamentals. Aside from the precipitous decline in crude oil which is rumored to be a sign of trouble in the economy, most data points suggest a very slow, yet stable, recovering economy for the time being. In our view, the crude oil decline has more to do with supply, than demand; thus it shouldn't play a factor in our presumptions regarding Treasury trading. Further, although there are certainly bones to pick over last week's bombshell employment report (such as most jobs created were low quality or part time), it probably won't matter for the time being; holiday cheer is in the air. Accordingly, we tend to believe the 30-year bond will struggle to surpass the mid-144s to 145 area. Aggressive bears might look for a bearish play in that price range but keep in mind, if are are wrong about that level holding the next resistance lies near the 148ish high posted in the mid-October panic. **Consensus:** We are bearish from the mid-144s to the 145ish area. However, seller beware...the next "good" resistance won't be until 148ish if the aforementioned level is broken. Short January 136 puts and 145 calls for about 56 ticks (see details at bottom of newsletter). It is easy to get bearish the S&P on the heels of one of the quickest and steepest rallies in history. However, we caution that this bull likely has room to run. Unlike the mixed seasonal picture in Treasuries, there are no questions about the seasonal tendencies in equities during this time of year. Specifically, the Stock Trader's Almanac points out that since 1950, December has been the best month for the S&P and the second best month for the Dow and the NASDAQ. Of course, there are always exceptions, such as 2001 which saw a 6% decline in the major indices. Nevertheless, more often than not the "Santa Claus Rally" makes an appearance. In addition, the fourth quarter triple witch is typically the most bullish of the year. According to the Stock Trader's Almanac, the Dow has been up 17 of the last 22 occasions. From a charting perspective, we see significant resistance near 2083, and again at 2095. 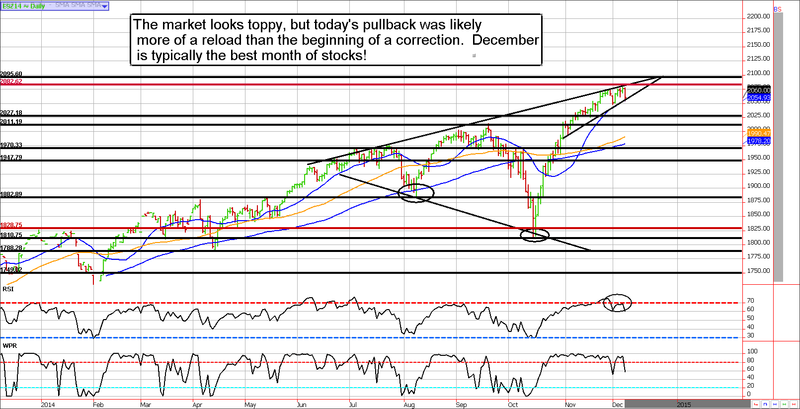 We suspect these levels will be seen in the coming weeks as the Santa Clause rally unfolds. Aggressive bears might consider nibbling on positions near 2083, but the better trades will be from 2095, and maybe even 2110ish depending how holiday trading goes. Keep in mind that the S&P is significantly weighted by energy stocks. Therefore, $60 crude oil is weighing heavily on the index. If crude oil can find a way to stabilize, we should see the stock rally resume as the New Year approaches. **Consensus:** 2083 is taking much longer to arrive than we had anticipated, but we still believe it is in the cards. Further, 2095 seems relatively likely on the Santa Clause rally. We'll consider turning bearish near 2095ish to 2110ish. September 24 - We recommend selling the December Euro 123.50 puts and the 132 calls for about $800 per strangle. October 29 - Buy back Euro 132 calls to lock in profit of about $300 per contract before transaction costs. November 4 - Sell December Euro 128.50 calls for about 28 ticks. This re-strangles the market and brings in a little more premium ahead of the employment report. 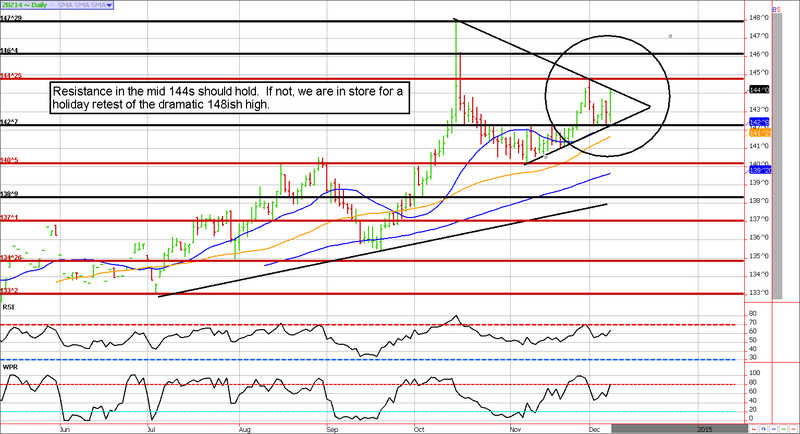 November 10 - Sell January crude oil 87 calls for about 40 to 45 cents. November 17 - Buy back the January crude oil 87 calls to lock in a profit of about $230 to $260 per contract before transaction costs. November 21 - Roll long mini grain scale trade positions into the March contract (while cutting wheat quantity by 50% and corn by 66%). Thus, one lot traders are holding 1 mini corn and 1 mini wheat. December 1 - Roll the January crude oil 70 puts into two February 61/75 strangles. December 5 - Buy back the Euro 128.50 calls to lock in a profit of about 31 ticks before transaction costs per lot.